Ok, so I apparently missed the bandwagon on crispy roasted chickpeas. Everyone was doing it ages ago. This isn’t surprising given that I often am behind the 8 ball. I missed the kale chip bandwagon too, which was just as well since no one in our family ended up liking them. Marcus ate some, but I think he only did it for the salt. But I digress. I somehow stumbled across crispy chickpeas on Steamy Kitchen and immediately decided to try them out on Marcus. Marcus is a picky little fella, but he does love crunchy food. Chips, croutons, nuts, pretzels, etc. So long as the crunchy item is not a fruit or a vegetable, Marcus will eat it. It’s too bad that most crunchy foods that fit that description (aside from nuts) just aren’t that good for you. Then along come crispy chickpeas. 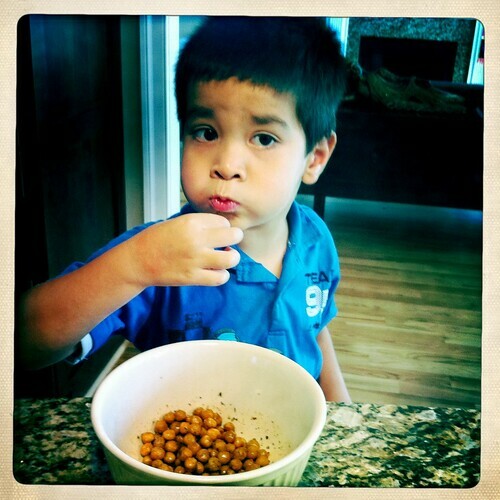 They’re crunchy, brown (why do kids love brown foods? ), tasty, healthy, and easy to make! The ingredients are ultra-simple: chickpeas, olive oil, salt, and spices. You can get as creative as you want with the flavorings (see links above for suggestions), and you can go savory or sweet. I decided to go simple savory for this first go-round. Knowing that Marcus is more likely to eat things that he’s had a hand in making, I enlisted his help to make his after-school snack. I have to say that it was a resounding success. I thought the chickpeas were great. More importantly, Marcus loved them. I asked him how much he liked the “gobble gobble garbanzo beans,” and he said: “As big as a humongous truck because they’re so yummy and because I like them so much, Mama!” He proceeded to eat three quarters of the batch, murmuring happily to himself as he crunched along. After he finished the last one and licked his fingers clean, he announced, “I need to tell you one more thing about these. I like spices. I like salt. And I like garbanzo beans.” Hooray! So here’s the basic recipe, with kid-friendly steps noted. Preheat oven to 400F. Set up baking sheet in front of child and let him line it with paper towels. Pour chickpeas into a strainer and rinse them thoroughly. Remove any of the thin skins that fall off. Tap the strainer to get rid of as much water as you can. 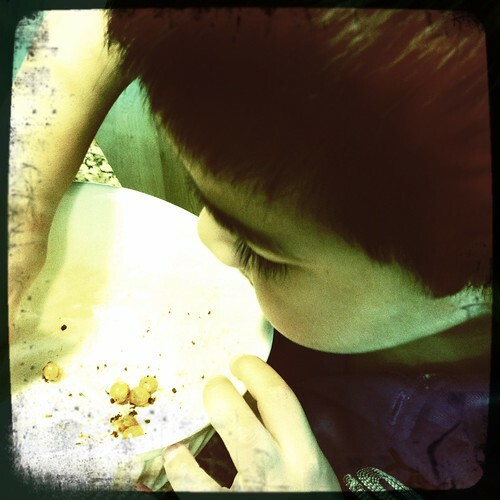 Then let child pour the chickpeas onto the paper towel and spread them out with his hands. Get another paper towel and let him use it to roll the beans around to thoroughly dry them. Remove and discard any additional skins that fall off of the beans. Measure out a small amount of olive oil (we only needed about a teaspoon or so) and let the child pour it onto the chickpeas. Let him roll the chickpeas around in the oil with his hands until they are thoroughly coated. Then it’s hand-washing time after you pop the baking sheet into the oven. Roast the chickpeas for 30-40 minutes until they are golden brown and crunchy all the way through. We had to roast ours for a good 45 minutes to get them all crunchy (but be careful not to burn them!). 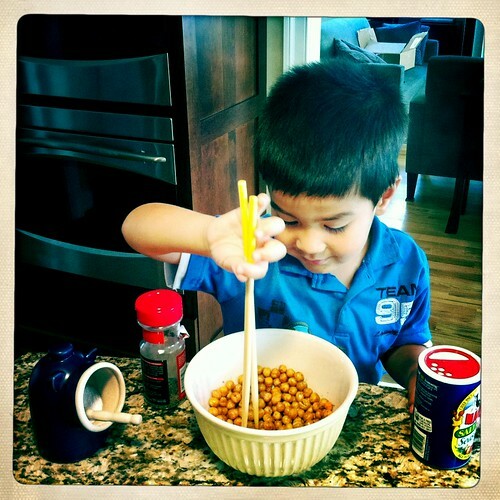 Pour the chickpeas into a big bowl (to help avoid burns) and let the child put in the spices. We used salt, pepper, and Magic salt free seasoning. Let the child mix the spices in, then taste and adjust the seasonings as needed. Enjoy!